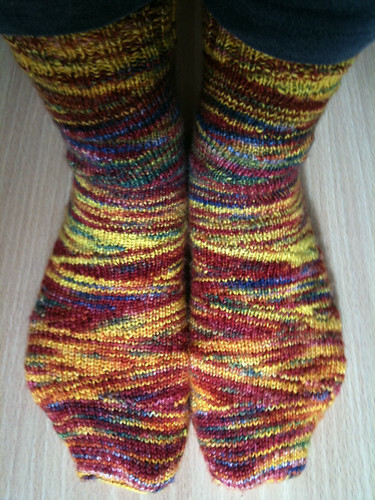 Jaywalkers knit with Light Brown Hare‘s Three Hares sock yarn, colorway: Prometheus Fire. 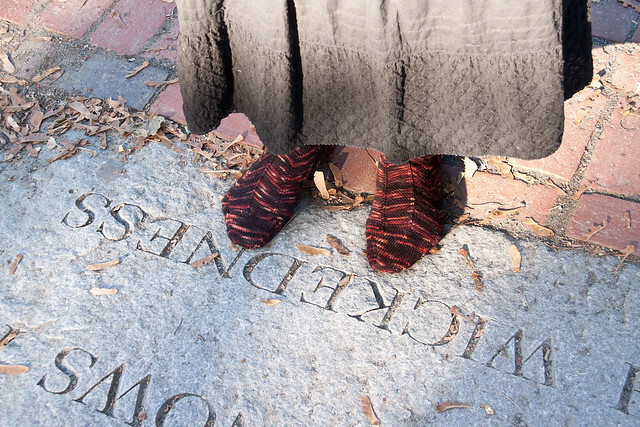 photos taken at the Salem Witch Memorial and at the Bewitched statue at the other end of town by Aram Comjean. 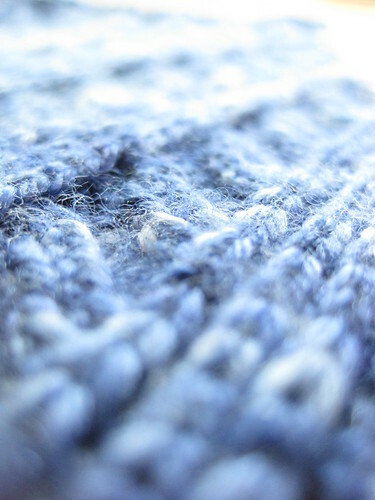 Who likes taking photos of their knitting projects? I do! I do! How’s this for a lesson in depth of field? I don’t care that the table cloth is wrinkled… I like this photo. 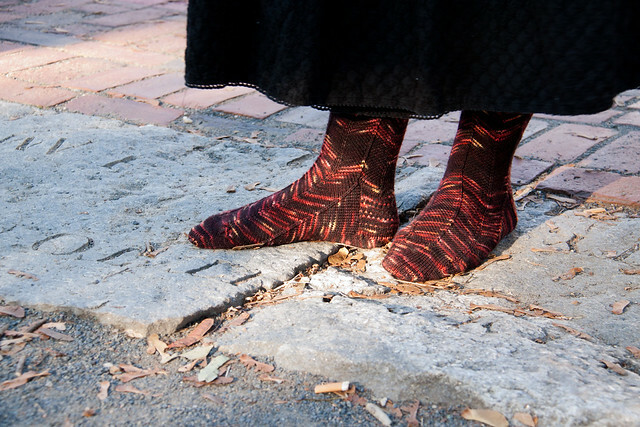 Not much else to say … this pattern is Cookie A’s Rick from her book “Sock Innovation”. Surfing ravelry for fun sock patterns I found the good ole’ Mojo, socks look normal when you wear them but when you take ’em off they’re all Dr Seuss-y. 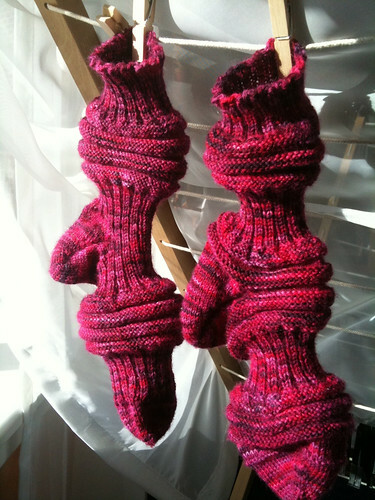 Here’s the pattern’s source site: Some Knitting Required. Photography assistance by Wendy K.
The yarn for these was dyed by Kaostling and sent to me as part of the Sock Blank Swap on ravelry. Kaostling noticed the Battlestar Galactica bent to my projects since everything I’ve worked on in the past year has been for the BSG Fleet Power Battle game on ravelry… so she named her dyed sock blank “What happens when you feed crayons to a daggit”. 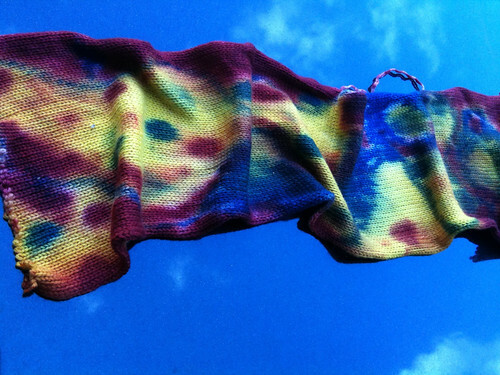 The challenge for the dyed sock blank swap was to use the primary colors. Since the resulting colorway was somewhat random I looked for a pattern that would have fun color pooling and found this “Rainbow Socks” design from Germany. It lent itself nicely to this yarn, and surfing around looking at other projects I noticed a lot of people are using it for animal stripes . 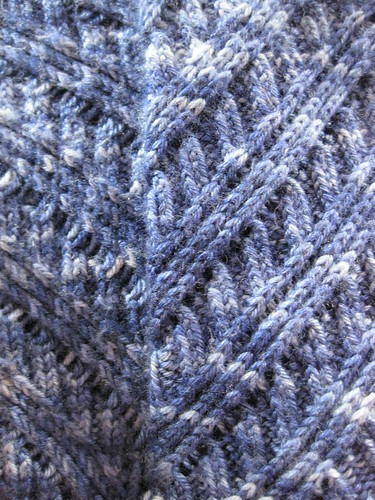 Fun pattern, the short rows ended up becoming a breeze. 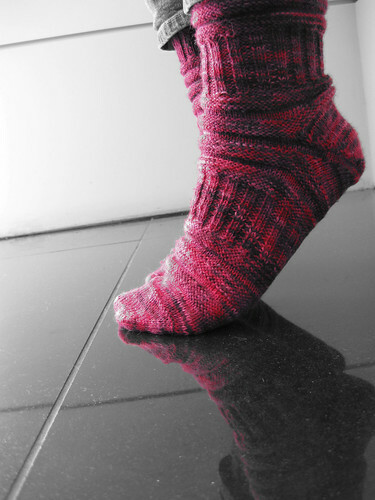 I did the pattern toe up, and played with making a differently worked heel. 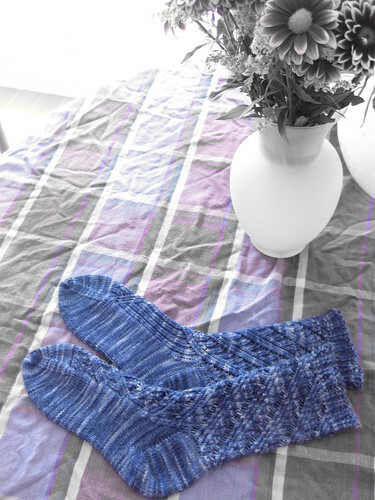 The beauty of these sock blanks is how you can come up with the same color pattern on both socks, the two socks match almost perfectly. The clever thing with the sock blanks is that there’s two strands of yarn together so however the piece is dyed, both socks end up identical. 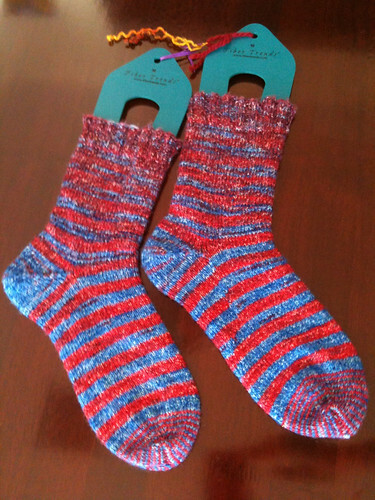 I snipped the sock blank in the middle and wound it off into the two red halves and the two blue halves. 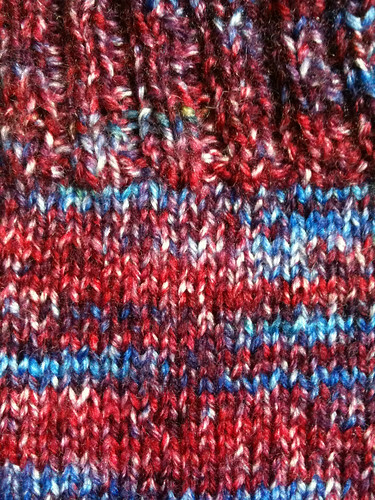 Using the same concept that I used for these socks that I knit before using Noro, except I did leg down and not toe up, figuring the middle mushy red and blue part was more interesting than the plain red and blue stripes that develop as I worked through to the outer edges of the sock blanks, the parts with the more solid colors. 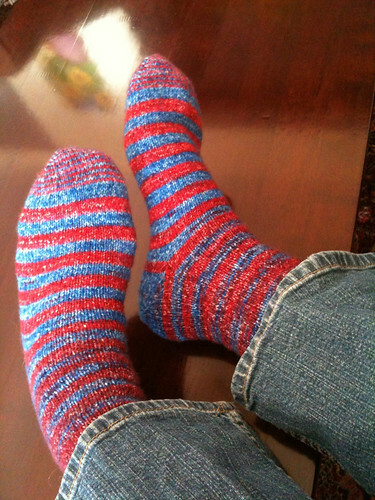 I knit five rows from the red side yarn and then five rows from the blue side yarm, all the way down the sock. Here’s the top part around the leg which came from the center of the sock blank, the idea being that the coloring is more subtle on the part of the sock that tends to show more often. 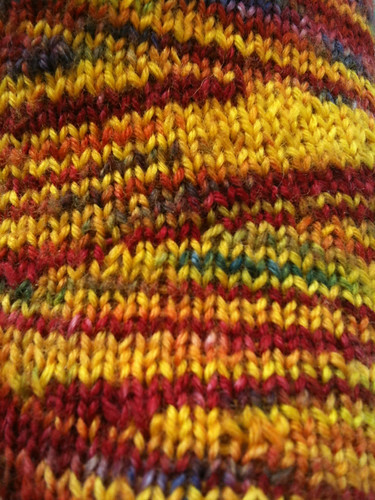 Working my way down the sock the colors become more pronounces as stripes. I used the blue part to work out the heel (there’s still some dashes of red in the the field of blue over the heel), and finished the toe with alternating one row blue/one row red. I have to say that this whole project was a blast… not only dying the sock blank, but working the yarn interleaved like this to have more fun with the color. Send a note if you’d like more information on this pattern. I don’t think writing it up as a pattern, per se, is worthwhile since the design is coming from the colorwork on a standard sock pattern. But I’d like to hear feedback if anyone else does this sort of thing. 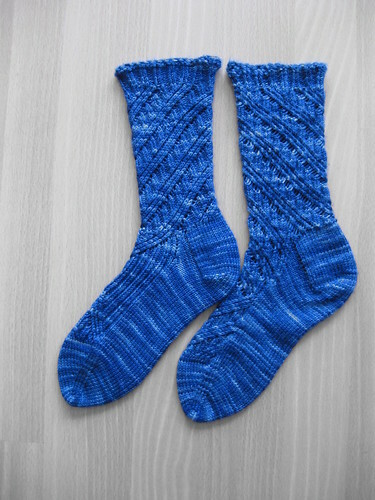 It’s over on ravelry as Two Days for Gaeta, done for the BSG FPB game over there. 😉 btw… I should be using a better camera than my iphone for these photos, huh? 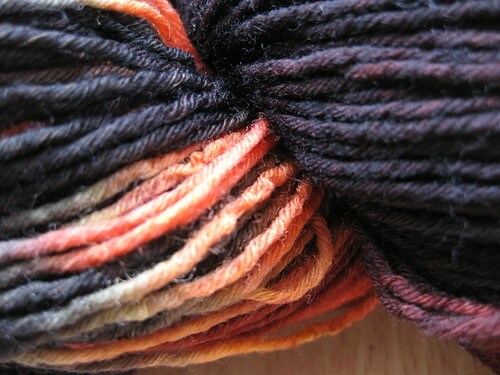 Never done a swap before, never dyed yarn before… why not combine the two? I found this dyed sock blank swap group at ravelry.com and jumped in, bought three sock blanks from knitpicks, with the jaquard dye, and had at it one weekend, doing all three blanks at once. 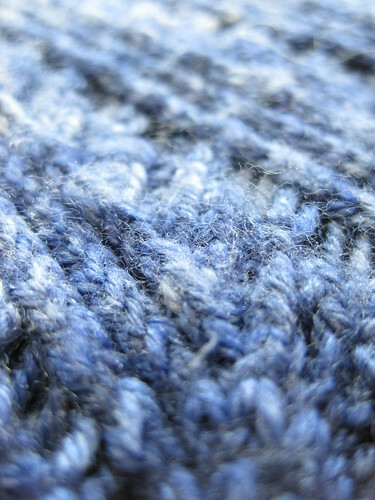 Knit picks put together a nice video that they have up onYou Tube to learn how to do it. Realizing I needed more paraphenalia, squeeze bottles for the dye, gloves, a big pot for steaming that will become unsuitable for food after using it for this process… plastic wrap, good ventilation… I pulled out a big piece of scrap wood I use as my can-crap-it-up craft surface… I pulled out a paint tarp after look at my white kitchen. What a process… I had no idea, and I totally get why people use studio space for this sorta project now. Well, here ya go, my finished yarn blanks. I did the “eye of jupiter” one first, the one I ultimately sent to my swap recipient. The BSG game people at ravelry have done a ton of “eye of jupiter” motifs, so I figured I’d jump on the bandwagon… realized it ended up looking like the poppy on the Alarm cd back from the 80s, which I also painted on a denim jacket back then. It’s like… I keep painting this motif over and over again, and I don’t know why… wonder if it indicates anything. I did the bottom one next, I did stripes across and a stripe all the way down (which doesn’t show in this photo), just to get an idea of how the sock blank distributes as you knit it into a sock. 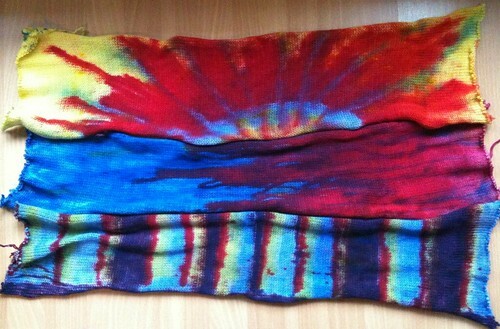 The middle one, I did with the intent of knitting up like my Tori’s Toastie Airlock Socks. Where rows are done starting at both ends of the yarn, so it’ll be red and blue stripes, with it kinda munging together when I get to the end, which will end up being the middle of that sock blank… My big question would be if I do the more pronouncing striping at the toe of the sock? or up around the calf? and do I do equal sized stripes or do I increase as I go? That’s the fun of these blanks tho, it lets you plan and have fun with it. I also received my sock blank in the swap already… which I thought was nicely done by ‘kaostling’ from ravelry. 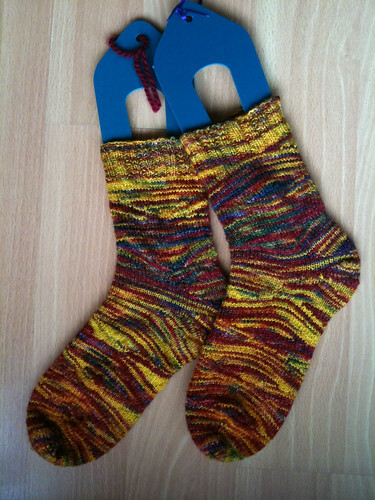 I’m mulling over using the Rainbow Socks pattern , , for these, since that pattern is also something I’d like to try. Keeping your feet toaster warm while you’re airlocking your colleagues. 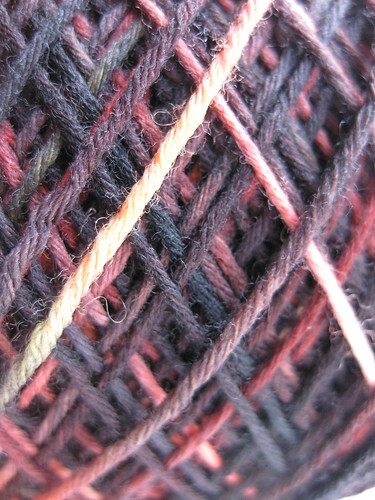 The beginning of my first project for the BSG FPB game at ravelry.com. I’m using the colorway starting from both ends. To do this I wound the yarn, finding two repetitions of the colorway and winding into 2 balls of yarn. And then turning each of those balls of yarn into two more, starting at end, and starting at the beginning, to make the color stripes go up and down the sock. Knitting in the round, for the FTL challenge. First time I’ve used Noro. The Sock of Doom mailed off to my Sock Wars 2006 target in Arlington, VA.
For my birthday last year Peg gave me some Opal sock yarn and small double pointed needles. 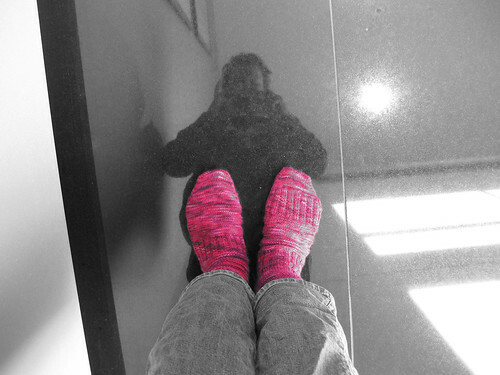 These socks represent the first time I knit in the round, which is why I’m not showing the cuff, it’s kinda messy. :-] I did most of the knitting on the plane ride out and back from visiting my cousin in Albuquerque.